SARATOGA NATIONAL CEMETERY--New York Army National Guard Sgt. Nicklaus Hilts, presents a U.S. 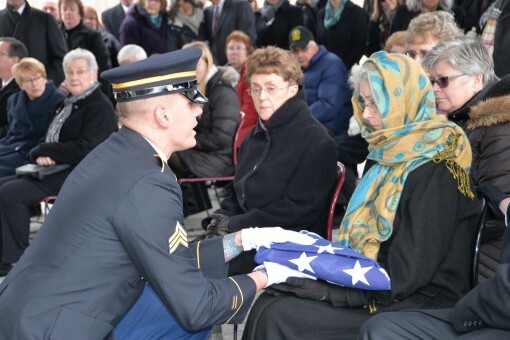 Flag to a family member of Army Veteran Lawrence Ostwald during his burial at Gerald B.H. Solomon Saratoga National Cemetery, in Schuylerville, N.Y. on December 15, 2017. Ostwald who served in the U.S. Army from 1951-54 was one of the 11,170 veterans the New York Army and Air National Guard provided funeral services for during 2017.